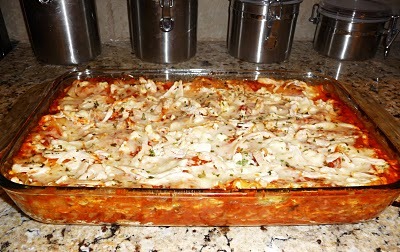 I got this recipe out of the Taste of Homes.We had this for dinner tonight,and it was fantastic!It is also a healthier choice of lasagna because it uses chicken rather that beef! In a medium bowl, combine ricotta, cottage cheese, spinach, egg, oregano, and black pepper. Prepare the lasagna according to the boxes directions. Drain. Rinse with cold water and drain again. Set aside. While noodles are boiling, remove skin from chicken and cut, or tear, into bite size pieces. You should end up with about 3-1/2 cups of chicken. Cover loosely with foil and bake for 40 minutes at 375 F.